When I was growing up I didn’t think much about turnip greens because they were ubiquitous. They’d be served at home regularly, most restaurants had them on the menu, and any “meat and three” joint or cafeteria would serve them. As long as there was a bottle of pepper sauce – hot peppers in vinegar – on the table to sprinkle over them I was good. Turnip greens were one of the many Southern staples that I didn’t much think about or miss until I began to travel and lived in places where they were hard to get or completely unavailable. That’s when I began to pay more attention to them. I began to grab them fresh when I could find them. I questioned older Southern cooks about how to prepare them. I also began to experiment with collard greens which were generally less served in my own native environs. I enjoy cooking collard and turnip greens together; turnip greens have a bit more of a bite and the collard greens pull that down a notch. I even began to play around with the actual turnips, which were rarely served on Southern menus. I occasionally make a creamed turnip puree which is good to spread on bread or use as a dipping sauce with a plate of crudités. Several years ago my mother, knowing my appreciation of greens prepared well, mailed to me a recipe for “turnip green soup” that she had cut out of the newspaper. I have a rule that I never tamper with a recipe until I have prepared it as written at least once. After that, I can start playing around. I thought the “turnip green soup” would be a recipe that I messed with because it used frozen turnip greens and some canned ingredients. I would make it their way and then see how I might improve it with fresh ingredients. But here’s what happened: It was so delicious as written that I wasn’t sure I wanted to mess around with it. I did tamper with it a bit though, and have made substitutions when I was missing an ingredient in the pantry. When fall weather and football season roll around, it’s a great quick meal to prepare. I cook a large batch of it in a cast iron dutch oven, transfer it to containers in the refrigerator, and eat on it for a few days. You must have cornbread with it and I sometimes just make a cake of cornbread but I prefer to make corn sticks as the accompaniment so that I can just dip the corn stick in the soup. I often serve turnip green soup as a starter course to my New Year’s Day luncheon. A few years ago, when my sister-in-law ran her first half marathon in Huntsville, I prepared a pot of it for lunch after the run and found that it was the perfect post-run comfort food. Friends from Ohio have transferred it up North and I hear it “has legs” along Lake Erie. I am teaching a Saturday morning class this fall and there are hours of college football to watch when I get home from class. When I left class around 11:00 this Saturday morning, I ran by the store to pick up some ingredients, came home, made a batch of turnip green soup and corn sticks, and had a hearty meal before my main game aired at 2:30. Here’s the recipe for turnip green soup as I usually make it. It is a forgiving recipe, open to substitutions or deletions depending on taste. It can easily be a vegetarian dish if one is so inclined. Combine all ingredients in a soup pot. Bring to a boil. Reduce heat to a simmer. Cook until sausage is done. Serve with corn bread, corn muffins, or corn sticks. 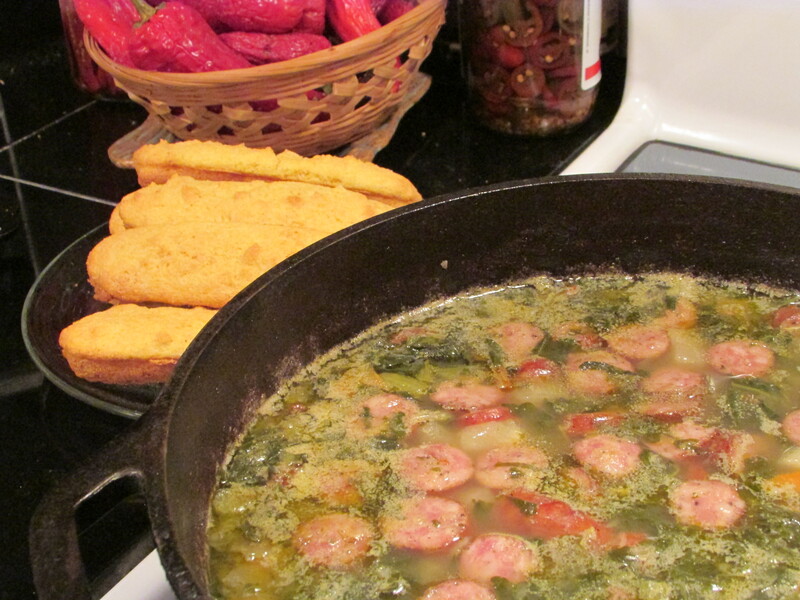 This entry was posted in food, the south and tagged food, recipes, southern foodways, turnip green soup on October 19, 2014 by gedwardjourney.